The HP Spectre 13 x360 is a rather attractive piece of kit. 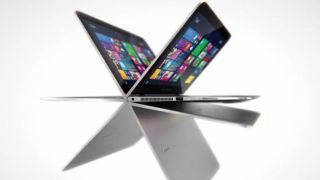 HP looks set to add another model to its bulging line of 2-in-1 laptops following the emergence of a new laptop called the Spectre 13 x360. Unearthed independently by two websites, it appears to be running on a fifth-generation Intel Core Broadwell-U processor rather than the Core M that powers the Lenovo Yoga 3 Pro, a device that shares its peculiar 360-degree design. Other quoted features include a 13.3-inch display with a 2560 x 1440 pixel-resolution, 8GB of RAM, 256GB or 512GB of storage, a Core i5 or Core i7 CPU, Wi-Fi, Wi-Di, Miracast, three USB 3.0 ports, HDMI, MiniDisplayPort and a SD card slot. Expect it to run Windows 8.1 and offer up to 10 hours of battery life thanks to the laptop's 56Whr battery. With a 15mm (0.6-inch) thickness and a weight of 1.5Kg (about 3.3 pound), the Spectre 13 x360 is heavier and thicker than Lenovo's svelte rival. As for pricing, Liliputing quotes 1299 Euros, that's just over £970 ($1461, AU$1848) although we expect the actual retail price to be closer to £900. The best Ultrabooks in the UK? We've got them lined up.